Richmond Friends School is a Preschool-8th grade independent Quaker school founded in 1971. Our multi-aged classrooms are purposefully designed to have low student to teacher ratios allowing for customized instruction, expectations and assessments tailored to the academic and social needs of each individual child. Students are challenged to solve problems critically and collaboratively in a rich and nurturing community where faculty and staff, parents and guardians, and students are all important partners in the dynamic process of learning. Our graduates go on to be life-long learners and compassionate citizens committed to making the world a better place. Summer Camps- Back by POPULAR demand! Ready for a GREAT July? Richmond Friends School is offering camps for your kiddos this year led by our amazing faculty members! Check out the list HERE. Ready to pay for camp registration? You can do so here. Simply follow the links to “Donate”, then write “Camp Fee” in the memo line. Our supporters and sponsors help make a Quaker education accessible to so many students in our community. We wholeheartedly thank you ALL for your gifts of support. This month, we’d like to highlight First Bank Richmond in Richmond, IN. Thank you for your sponsorship of our students during the Read-A-Thon! Everybody loves a DISCOUNT! Earlham College faculty and staff NOW receive 10% off their tuition and summer camp fees at Trueblood Preschool. 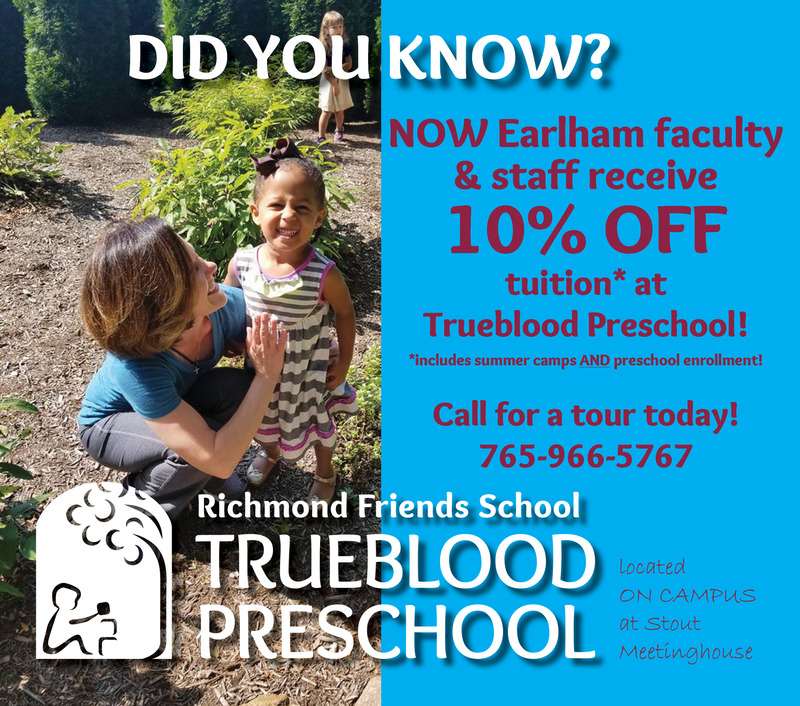 Interested in sending your little one to Trueblood? Call for a tour today! 765-966-5767.